Some leftover from a ball of parcel string bought in 2003 is finally put to good use when I made these 2 flower pot holders. 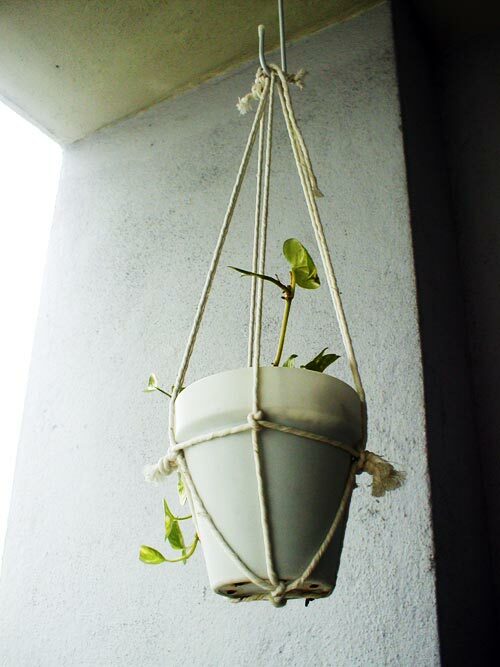 Our tiny balcony is running out of space for all our plants, and these crawly babies were twirled around some old disposable chopsticks stuck in the pot. They didn't look very healthy then. Since there are some pre-existing nails on the ceiling (probably fixed by the previous tenant to put up blinds), we thought that a hanging garden would be good for their new home. 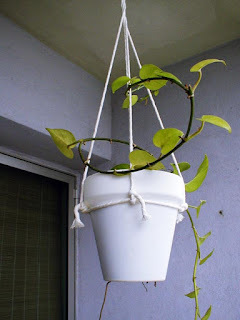 True enough, they now look really happy with their vines hanging down freely from the pots.